Who doesn’t want healthy, young and beautiful skin? Great skin can take years off your appearance, and as your skin is often the first thing people notice, it’s perfectly reasonable to feel self-conscious if you aren’t happy with the way you look. Issues like sagging skin, acne, fine lines, uneven skin tone and wrinkles are very common complaints from both men and women, but there are ways to reduce, or even resolve, these issues. Follow these simple steps to create a routine that will leave your skin looking flawless, smooth and potentially even halt the ageing process. Whether it’s regular skin treatments or changing your diet, even following just one tip from this blog can make a huge difference. 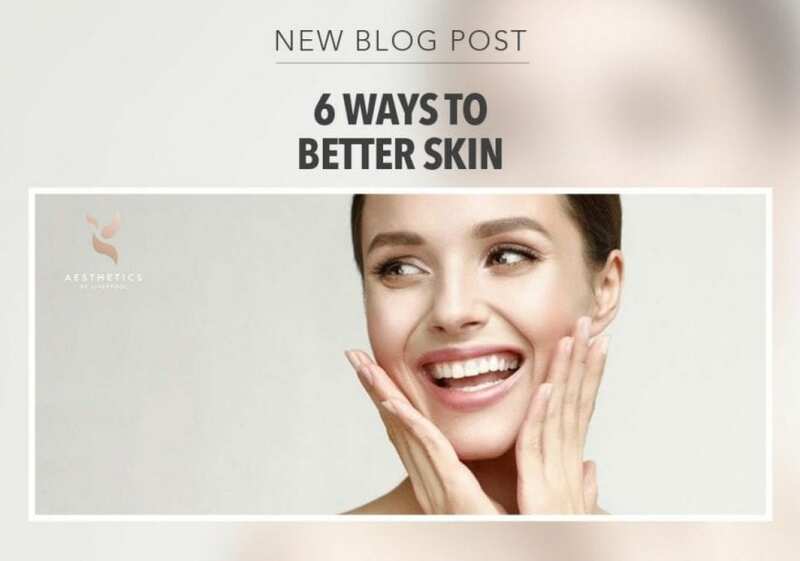 So, read on to learn the six best ways to tackle bad skin, prevent future outbreaks and reduce the signs of ageing so you can feel confident, happy and glowing. Eating a balanced diet is important when considering the health of your skin. Fruit and vegetables contain antioxidants that help to protect your skin from cellular damage caused by smoking, pollution and sunlight, which will eventually create wrinkles and age spots. Try to eat five portions of fruit and vegetables a day. Carrots, sweet potatoes, pumpkin and spinach, are all great for healthy skin cell development and promotes a healthy skin tone. Another tip is to avoid crash diets. Repeatedly losing or gaining weight can cause sagging skin, wrinkles and stretch marks. Crash diets can also leave your body short of the essential vitamins and minerals that you need to maintain a healthy, bright complexion. Make sure you stick to a balanced diet that can both help you achieve your weight loss goals and keep your skin looking youthful and smooth. It’s common knowledge that if you want gorgeous hair you need to go to the hairdressers regularly, or if you want an amazing smile you need to see your dentist on a six-monthly basis, but so many people haven’t realised that their skin needs the same attention. Cosmetic skin treatments are the perfect way to keep you looking and feeling amazing, but they work best if you incorporate them into your beauty routine. If you do this, you will see a significant change in your skin’s long-term health and your body will continually produce the proteins and hormones it needs for healthy skin and a bright complexion. There are a variety of treatments that can produce outstanding long-term results when used on a regular basis. As we age, our bodies produce less natural proteins and hormones such as collagen, elastin and Hyaluronic Acid (HA). These are all very important when it comes to maintaining healthy, tight and youthful skin. Without them, the skin starts to sag, wrinkle and age. But, treatments such as Skin Boosters inject these substances back into your body which gives your skin a natural boost by tricking it into producing more collagen, elastin and HA. LED Light Therapy is also a perfect treatment for those who don’t like needles, have scarring or suffer from acne. It penetrates the layers of the skin to stimulate collagen production, improving skin health and producing brighter, tighter skin. Moisturising your skin is very important when it comes to maintaining healthy skin. Facial moisturisers enhance the functioning of the uppermost layer of the skin, called the stratum corneum. This layer is made up of fat, oil and skin cells all of which naturally moisturise the skin. However, your skin is vulnerable and can get fissures on the skin and bacteria can enter the dermis through the cracks on the surface. If the stratum corneum dries out, it can not protect the layers of skin beneath which could lead to infections. If you moisturise daily, and especially when you notice your skin feels drier, you can avoid this. As well as making your skin appear pretty and smooth, moisturising ensures the continued health and protection of your skin layers. We all know the dangers of going out on a sunny day or sunbathing without sunscreen. UV rays are extremely dangerous and can cause skin cancer in those who religiously use sunbeds or go outside without protection. The rays can also cause wrinkles and sun damage on the skin, rapidly increasing the ageing process. However, you also need to be careful when indoors. UV rays can penetrate through the windows of your home or office, causing these wrinkles and brown spots to develop over time. Even when you are driving, you should pay attention to the weather. In America, studies have found higher rates of skin cancers on the left side of the face and body than the right as for them this is the side that is exposed more when driving. So, make sure you are always wearing sunscreen or a moisturiser with an SPF. When you are in a deep sleep, your body goes into healing mode. Not only does this leave you feeling well-rested but it also gives your body and skin a health boost. But, if you are lacking sleep you put more stress on your body as it has to work harder, without having that time to recover and repair during the night. This causes it to release more adrenaline and cortisol which can lead to breakouts and other skin problems. A study in China even found that insufficient sleep was a significant risk factor for acne in adolescents. Clearly, getting your seven to eight hours sleep is vital if you want to clear up your skin and prevent any further problems. Stress takes its toll on nearly all of your body. Your mental health isn’t perfect, and you feel tired and worn out. One study at Stanford University found that during exam time students who felt stressed had more severe acne breakouts than those under less pressure. But why? Your body produces more cortisol when you are stressed, which makes the skin oilier and decreases its ability to fight off bacteria. To avoid these severe breakouts, you need to take steps to manage your stress levels. Look for new ways to battle through stressful periods and overcome any issues you may face. Regular stress-management techniques, such as yoga, deep breathing and meditation, can help you to calm and refocus yourself. This can improve conditions such as acne, psoriasis and rosacea. There are many different ways that you can impact your skin’s health, but these are the most important ones. Smoother and healthier skin can be achieved by creating a better routine and sticking to it. By introducing cosmetic treatments to your routine, you can see breathtaking results that last. Here at Aesthetics of Liverpool, we understand how to analyse your skin to ensure that you pick a treatment that will have the greatest effect on your appearance. We have helped people with a variety of different skin types and tones, and are proud to have an extensive list of happy clients. Contact us today and organise a consultation with one of our experts where we can help you find the right treatment for your skin.